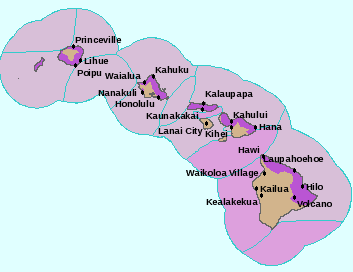 A high-wind advisory remains in effect for all islands until 6 tomorrow night. The state's budget crisis continues to echo through the Capitol as the Senate prepares a budget that moves inmates to the mainland by closing a prison module, cuts the work year for school principals, and even includes a 3 percent pay cut for lawmakers, judges and state executives. The state Senate Ways and Means Committee yesterday produced its draft of the state budget, avoiding a broad-based tax increase but scooping hotel-room taxes from the counties to help close the state's $1.2 billion deficit. The state Department of Human Services will lay off nearly half of its 517 workers who process applications for government benefits and will shut down 31 eligibility offices statewide under a cost-cutting plan set to go into effect June 30. A modernization and consolidation plan for some operations within the Department of Human Services would expand benefits for the needy and save the state about $8 million a year, the Lingle administration says. Cockfighting is illegal, but that didn't stop Hawaii lawmakers from advancing a resolution yesterday recognizing its cultural value. State Sen. Sam Slom, president and executive director of Smart Business Hawaii, and Malia Zimmerman, co-founder of online news journal Hawaii Reporter, have expressed an 11th-hour interest in purchasing the Honolulu Star-Bulletin. Data for pregnant women on the Big Island suggest about half of the island's 37,892 children under age 18 were exposed before birth to alcohol, tobacco and illicit drug use, researchers report. Local songwriter Roslyn Catracchia is asking the public to help in getting back her life’s work. Burglars broke into Catracchia’s home in Aina Haina Sunday, and stole computers that contained 20 years of her work. Forced to make difficult budget decisions due to a dramatic drop in tax revenue collections, Mayor Charmaine Tavares has proposed to eliminate Maui County's only helicopter ambulance service, her staff said. Keauhou Beach Resort's 40th anniversary celebration Sunday summoned memories for former employee Elaine Watai, of Kailua-Kona, who shared stories and old photographs of the hotel in its heyday. Kaua‘i Island School’s robot won’t be coming home just yet.